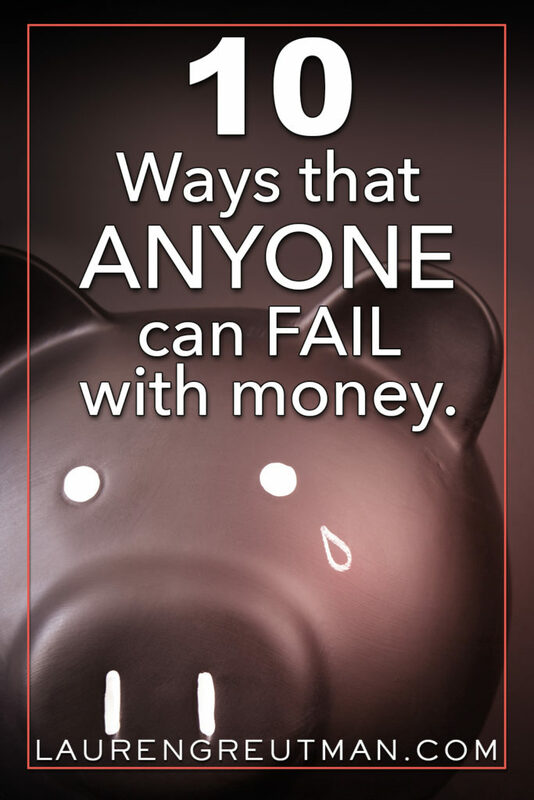 10 Ways ANYONE can Fail at Money ... Even if you're rich. Whether you're making lots of money and would consider yourself ‘financially successful' or you are drowning in debt and have a spending deficit, you can be Failing at Money. Failing at Money has to do with what you do with what you have, NOT how much money you make. We've all seen celebrities who live lavish and luxurious lives and wished we had that kind of money. Don't get me wrong, that does look really nice at times, but I've learned to ask myself, “Are they doing a good job actually stewarding the money they have?” Maybe. Maybe not. What if at the end of their lives they look back and realize that they wasted so much? It is also easy to look at many of the stereotypes of poverty and assume that “those people” are just bad with money. Maybe. Maybe not. What if they look back on their lives and see that they worked with what little they had the best they could. What are you doing with the little or much that you have? You can successfully manage your money or fail at money whether you have a little or a lot. Prospective Budgeting means that you are deciding where your money is going to be used before you spend it. 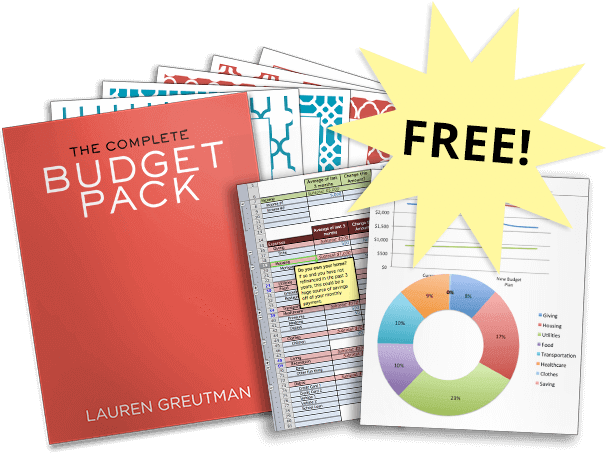 If you don't budget prospectively, you're honestly not budgeting at all. You're really just doing a spending review of what you've already spent. The problem with this is that it makes it next to impossible to keep track of every dollar that is spent over the course of a month. You're really just guessing and hoping things pan out by the end of the month and that you don't overdraw. Spending $5 here and $3 there each day all adds up. If your spouse is doing the same thing it adds up even faster! This is also one of the biggest hindrances to saving money for larger purchases or for your retirement. You have to be intentional and budget before you spend your money if you want to make financial gains. Even if you are budgeting prospectively, you should always be aware of your account balances. Different electronic bills get pulled out at different times. Debit card charges don't clear right away. Checks you write sometimes don't get cashed for a week or more. You need to be on top of it! It's really pretty simple, especially with online and mobile banking. I would recommend just popping into your account once in the morning and talking with your spouse about any spending plans there are that day, and then checking it once in the evening. Overall this will add a maximum of 5 minutes to your day. There is a great program called TRIM. You sign up for it and it tracks any unused subscriptions, then cancels them for you! Trim has saved folks more than $8 million – here are some of the things it does. All done via Facebook Messenger chat; Trim is not another app! Sign up for FREE Today – SIGN UP HERE. I cannot stress how important it is to exercise your giving muscle. There are always people more in need than you are. Even if you only have a little and can only give a little, give it. Exercising that muscle of generosity will make it easier to give more as your income increases. There's a story in the Bible where Jesus saw a poor widow give 2 small copper coins at the temple among many wealthy people who were giving large amounts of money. There were no checks or credit cards back then, so everyone could see the quantity everyone was giving, whether it was 2 pennies or a pile of money; people saw. Jesus said that this widow gave more than anyone because she gave out of her lack and not her abundance. She gave proportionately more of her money than the wealthy did. It's not about the amount you give, it's the act of giving that is important. You can use a credit card because you do have the money. If you fall into group #1, STOP USING CREDIT CARDS. Instead, focus your energy on budgeting prospectively, using cash, and building an emergency fund. This next statement might sound sarcastic, but I'm being completely serious: Aside from a car loan or school loan, would you have any debt if you didn't have a credit card? Probably not. Most Americans have consumer debt because they use credit cards. Plain and simple. If you don't use the credit card, you'll find a way to make it work without going into debt. If it's a spending addiction, like I had, check out my book, The Recovering Spender for some great tips on how to set up healthy spending boundaries. If it's unplanned emergencies that caused the debt, build an emergency fund as fast as you can, so when that big emergency happens, you can use cash! If you fall into group #2, you are probably using a credit card to build airline miles or to get some cash back on large purchases you have the money for. You probably also pay off your entire balance each month and never pay interest. Just make sure you're still budgeting for those expenses! This means that you are spending more than you are taking in. While you may have the money in your account, your budget is still at a deficit. This is something you need to eliminate before your savings completely disappears. A member of The Financial Renovation course posted in our Facebook group about this very issue. Once she started to more actively track her spending, she noticed how frequently she transferred a little money over here and there. It all added up! She realized that she had spent an extra $1,000 of her savings over the course of one month just because she was not paying attention! She was so glad she caught it. As a general rule, your savings account balance should NOT be dwindling. I mentioned this earlier, but this is so important! An Emergency fund is the first line of defense keeping you from going into debt. When Mark and I were on our journey out of debt, one of the first things Mark did was to sell his precious drum set so we could have an emergency fund. It was a HUGE sacrifice, but when our washing machine unexpectedly died, we were able to buy a new one with cash! The freedom and relief we felt to know that our “emergency” wasn't an emergency anymore was the BEST feeling. Not only did we completely own our new washing machine, we didn't have a credit card payment! As both of those realities sunk in, it brought us a sense of pride. It would be great if we could stick our heads in the sand and make money problems just disappear, but it is one part of adulting that will not go away. You can be guilty of ignoring your finances if you make millions of dollars or only hundreds. Either way, if you pay attention to your finances you can find ways to decrease money waste, increase savings, and invest in the future. Goal setting is the cornerstone to achieving anything in life. Whether it's junior varsity sports, or a multi-million dollar corporation – setting goals is key to seeing change. If you want to see your finances get to a certain place, set goals. Set an overall goal, and then smaller steps to reach it. Just stay the course and when you get impatient or discouraged, take a deep breath, get your focus back, and keep moving forward. When we were in a mountain of debt, it looked like we would never see the light of day. But we set smaller goals. And bit by bit, choice by choice – eventually it melted away. You can do this! If you think just getting more money or winning the lottery will solve your problems, it's simply not true. It might help and it might make things easier, but it won't be the fix-all. You will see the biggest financial change by learning to manage what you have. I am not minimizing financial struggle. It is real. It is hard, and it makes things tough! But, if you learn to squeeze the highest value out of every penny you do have, it will do something to you. It will change your entire attitude. Being unthankful or ungrateful is different than desiring more. You can be thankful for what you have been given and still have larger goals. Besides making you grumpy and discouraged, being unthankful for what you currently have will cause you care less about what happens to your money. It can make it easy to slip into an attitude that says, “What does it matter if I save a little more or pay down a little more debt. Nothing is going to change. I'm never going to get that raise. Things will always be this way. Why Bother?” By the way… people that make 6-figure salaries feel this way too. But in the end, you're only going to hurt yourself with this attitude. Work with what you have. Get creative. Think outside the box, and use some of the links in this article to help you budget, start using cash, make extra money on the side, pay down debt, and build an emergency fund!